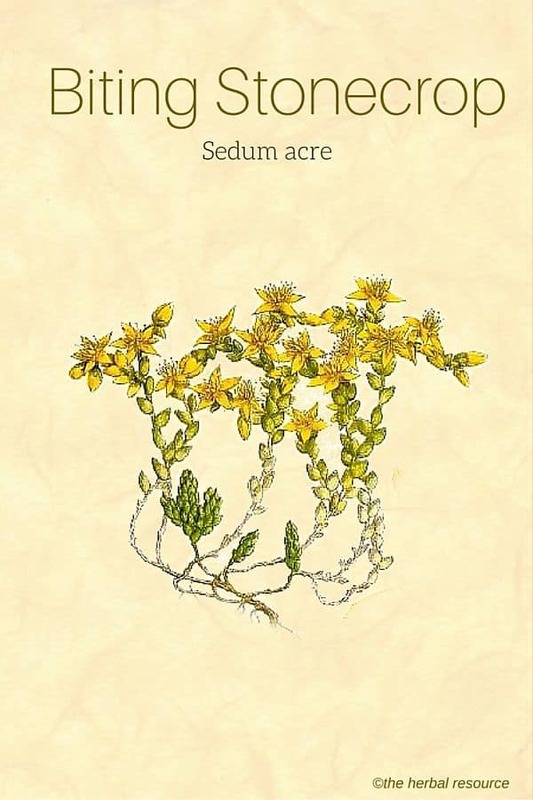 Other Common Names: Common stonecrop, golden carpet sedum, wall-pepper, welcome home husband though never so drunk, gul fetknopp (Swedish), helluhnoðri (Icelandic), orpin âcre (French), Scharfer Mauerpfeffer (German), pampajarito (Spanish). Habitat: The plant can be found growing wild in almost all of Europe, Asia, and North Africa. Today it’s a popular garden plant. Description: Biting stonecrop is an evergreen perennial plant that can reach up to 5 to 10 cm tall. It grows by creeping shoots and forms dense clumps or mats on stone walls, rocks, and dry stony ground. The Leaves are smooth-margined, egg-shaped, thick and succulent. The plant blooms from June to August. The flowers are yellow and star-shaped and form a tassel-like inflorescence. The herb has a strong peppery taste. Plant Parts Used: The fresh, crushed leaves or plant extract made from fresh plants are usually used externally in herbal medicine. The plant contains tannins, rutin (citrus flavonoid glycoside), several alkaloids, sedinon and sedridin and several organic acids. Animal studies have shown that some alkaloids can have major toxicological effects. The amount of alkaloid is significantly reduced when the plant is dried. Biting stonecrop has never been considered to play a big role in herbal medicine and even ancient literature warned against ingestion of the plant. It was, however, in the sixteenth century used as an ingredient in some remedies against intestinal parasites. In 1830 it was mentioned as a possible cure for epilepsy but was rarely used for that purpose because of the plants irritating properties and harmful effects. In traditional herbal medicine, the plant has often been regarded to have diuretic and laxative properties. Additionally, it was used as an herbal remedy for diphtheria, ringworm, to trigger abortion, and also scurvy due to the high content of vitamin found in the plant. The herb is known to be helpful to lower high blood pressure, but it should not be used as a blood pressure medicine. When sedum acre is used topically the plant extract can work as a local anesthetic and increase blood flow to the skin. The herb has been used to treat itchy rashes, ulcers and for the topical treatment of warts, pimples, acne dermatitis and corns. The alleged herb’s ability to remove warts and corns has not been scientifically proven. If biting stonecrop is used to treat wounds the extract must be diluted with water and it should only be used for short periods of time. It is advised to contact a trained herbalist or health care provider if the herb is intended as an herbal medicine. 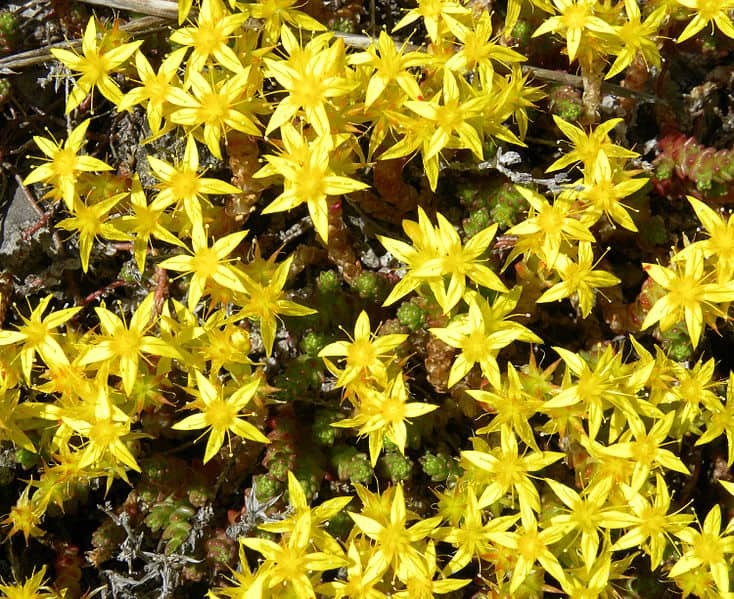 The extract from biting stonecrop can cause skin irritation and blistering. By direct contact with the eyes, the extract can cause permanent eye damage. Internal consumption of this herb is not recommended as it can cause headaches, lethargy, and vomiting. Chewing on the fresh plant can cause corrosion in the oral cavity and a local anesthetic effect on the tongue. 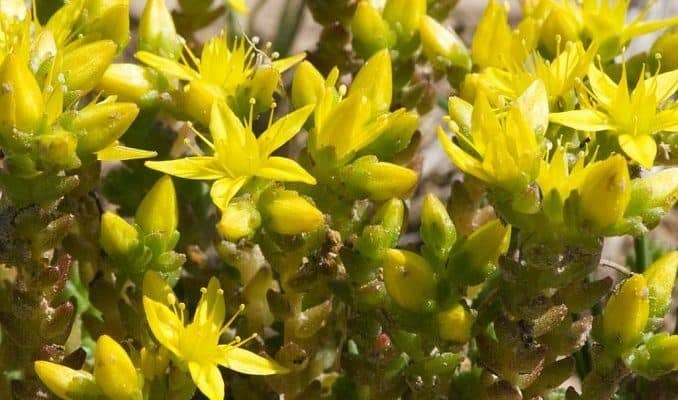 Biting stonecrop is a herb that one should use with caution in self-medication. When used in pre-made skin care products the amount of the plant extract is usually so small that such products are safe to use.